Mister Zee’s has only been opened for three days but I have been waiting months for this restaurant to open. We went last night for dinner and even though there was four of us, I proceeded to order almost half the menu. Chocolate baklava shake ($8.00). I must say this was one of the first things that caught my eye when I read the menu; I thought it was an odd combination but I definitely wanted to try it. It was a delicious chocolate milkshake and at first you couldn’t really sense any baklava but towards the last third you start to notice the filo pastry that has been blended through. I don’t know how well a milk shake goes with the amount of food we ordered, maybe this would be better if you were looking for something sweet after one menu item as opposed to half of the menu like we had ordered. Charcoal chicken served with Lebanese bread, toum (garlic dip), pickles (half $13.00). When the plate we put in front of us we were really underwhelmed as the chicken looked cold and dry but I was surprised to find it slightly warm. I ate a bit of the breast which was on the drier side but even when I ate around the thighs it was also dry. There was a nice flavour through the meat but all the deliciousness was in the skin. The salty charcoal flavours were delicious and the way it was cooked left the skin nice and crispy. I really wished the Lebanese bread would have been slightly warmed, it would have made a fabulous difference. The pickles were really strong, eye widening type of pickles but the flavours became refreshing as we were eating it between other dishes. My friend and I were still eating dinner when the waitress came over and gave us complimentary dessert, I presumed it was because we had given feedback in addition to my enthusiasm for their desserts. I thought it was so nice of them. Baklava ice cream sandwich ($6.00). Before we even ordered, I was asking the girl at the front counter many questions which included: what is adana? Is everything on the menu available? Do you have baklava ice cream sandwiches? She then explained that the ice cream sandwich was a literally a piece of baklava cut in half with ice cream wedged in the middle. It isn’t as sweet and overwhelming as it sounds because the baklava isn’t that sweet and flavours and crispy texture went really well with the ice cream. I would eat this again, but it is definitely not a first date food as it gets messy very quickly. Knafeh ($6.00). We were told that this was made by a local couple and I was super excited to try this ever since I had it late last year when we had that pop up shop. It had a delicious subtle sweet flavours of rosewater and pistachios with a beautiful smooth texture. I would have loved this if it was served warm. *drool* I was surprised for a place that would do a lot of take- aways had such nice spacious seating, good heavy cutlery and crockery. 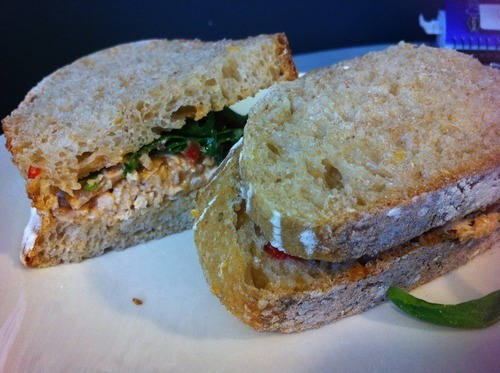 It is nice to have something different to eat when there are so many cafe and Asian options in the area. I will definitely be back to try more and eat more of what I’ve already tried. Waiting times didn’t take long, the prices are reasonable and the staff were very friendly and efficient. We spent just under $100 between the four of us ordering dinner and we were really full even before the desserts arrived but everyone knows that you have a separate stomach for dessert. I think you could easily be content with a single shish ($14.50) and leave enough room for something sweet. So by now, most people who had made a fleeting fitness New Year’s resolution would have given up (if you haven’t good for you!). I on the other hand, have made another type of resolution that I’m sharing with you all in hopes to keep me honest and get me through to fulfilling them before the end of the year. I want to cook several things this year, wait let me rephrase that, I want to cook several things really well this year. I may or may not have made them before and it might seem like simple humble items but they make a good basis for a classic cooking repertoire. 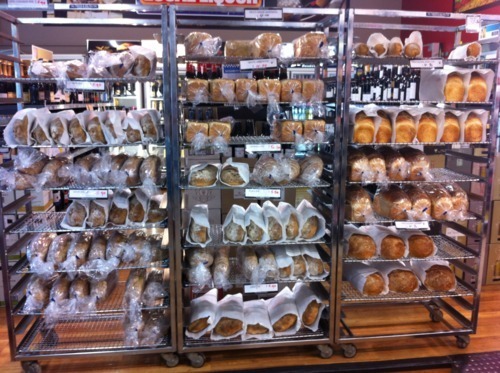 There are so many different types of bread, I’m not going to limit myself just to one. I’ve never worked with yeast before, but I love the smell of fresh bread (who doesn’t) and tasting warm bread with real butter is absolutely divine. If you have any recipes or tips that would be great! I love a good chicken curry but if I can, I want to make a flavoursome tender red meat curry that basically falls apart as you put a spoon through it. it might seem weird but I’ve never made a successful pancake outside of the pre-mixed shaker containers. It has always been my dirty little secret as a foodie, but with Shrove Tuesday coming up, there is no time like present. After my love of making cupcakes and my failure of making macarons (which TimmyC has definitely made up for), my next big love was going to be making tarts. I have made some but haven’t gotten around to getting to the perfect recipe. I think tarts are gorgeous, delicious and very instagramable. My lovely sister gave me the ice cream Kitchenaid attachment possibly two/three years ago now and I’ve never done anything with it. In my defense, that was roughly when I met Mr Frugii and my need for ice cream was taken care of. I should really throw that thing in the freezer so when the feeling arises I can make ice cream straight away without delay. There are probably other things that I also want to make but these 5 resolutions are a good start. If you have any ‘fool proof’ recipes that you would like to share, that would be super handy. Have you made any resolutions this year? A few of us from work headed over to Bread Nerds for lunch. I felt bad for sneaking there earlier to try their breakfast but lunch is a whole new ball park. The rolls are HUGE! 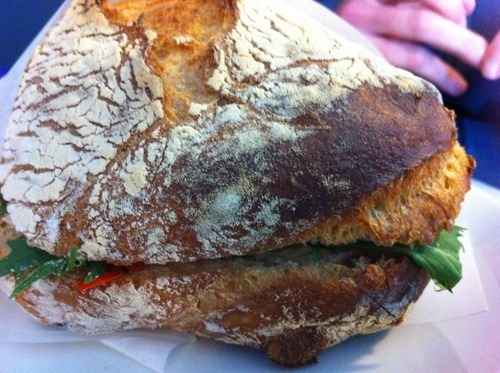 I don’t know how much I would enjoy the bread to filling ratio but my friends really enjoyed it. 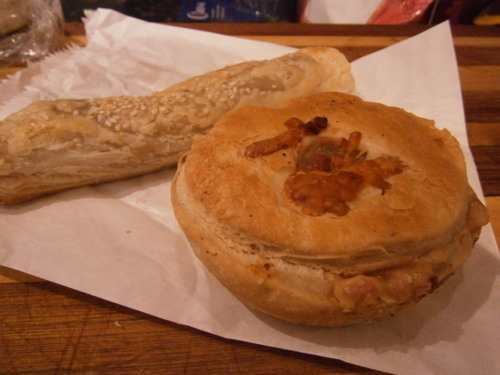 Breakfast pie with bacon and egg– this was sadly disappointing, it was really dry and had the texture of a really dried out quiche. 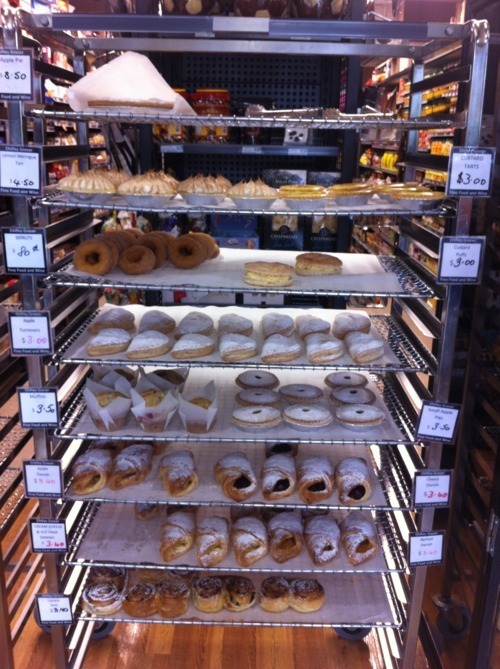 Despite the out of the way location (for me), there are still so many pie flavours I want to try and pastries that I want to eat. 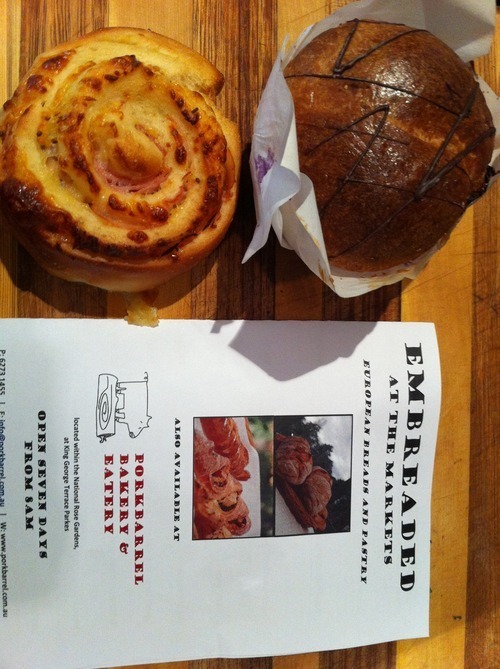 Pork barrel is now a bakery as well as eatery, supplying baked goods including breads, brioches and scrolls (oh my!) to the South Side Farmer’s Market. I did my usual casual walk by and when it registers in my brain that it’s maybe worth a try, I did a slow backwards walk and I’m glad I did! 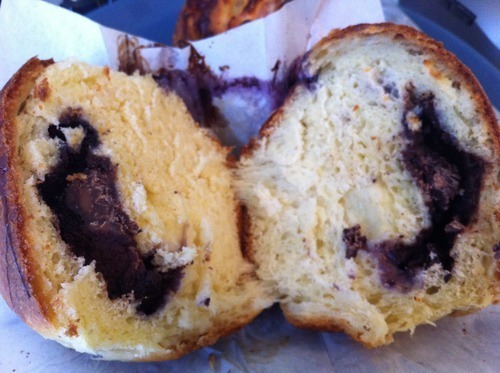 Blueberry and chocolate brioche ($2.50) I didn’t warm it enough that the chocolate melted (I didn’t even know that there would be chocolate inside, I just thought it was blueberry). I would have liked a little more filling but it was still very nice. Go and try their stuff today! Southside Farmer’s market is open every Sunday til 11:30am @ the Woden CIT campus! 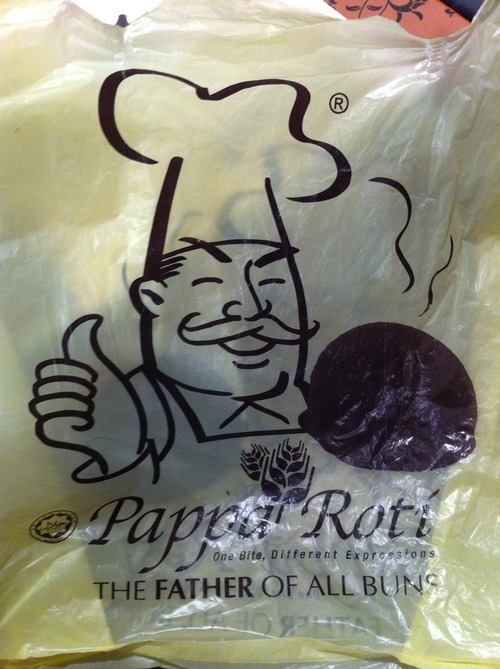 My sister was nice enough to get me some Pappa Roti before I left Sydney and with easy heat up instructions, I was able to experience hot fluffy roti back in Canberra. While I was heating it up in the oven, my whole kitchen smelt like a delicious coffee cream Swiss roll. Crispy on the outside with a warm fluffy centre makes it a sweet treat without being too heavy. Sorry Canberrans, they only have store in NSW, Vic and QLD. Bread Nerds- complete with map! Even if it’s off the beaten track. Well actually it is a new road out in Hume so new it isn’t even on the google maps yet, so you could understand the frustration of how to find it. 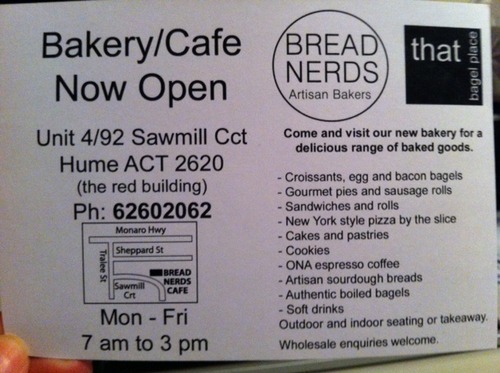 That bagel place sell bagels at the Kingston markets and my friend sent me a flyer that they had opened a cafe called Bread nerds. Once you hear about somewhere new, it seems to pop up everywhere! 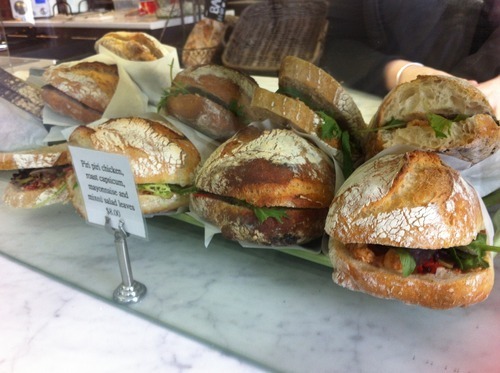 Later that week I read the Canberra times article and saw yummy pictures from Corridor Kitchen’s blog. 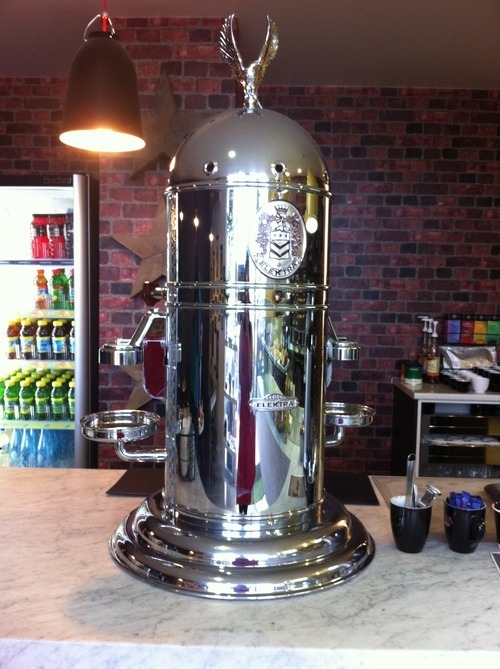 Fancy looking coffee machine but Timmy said it was just average coffee. 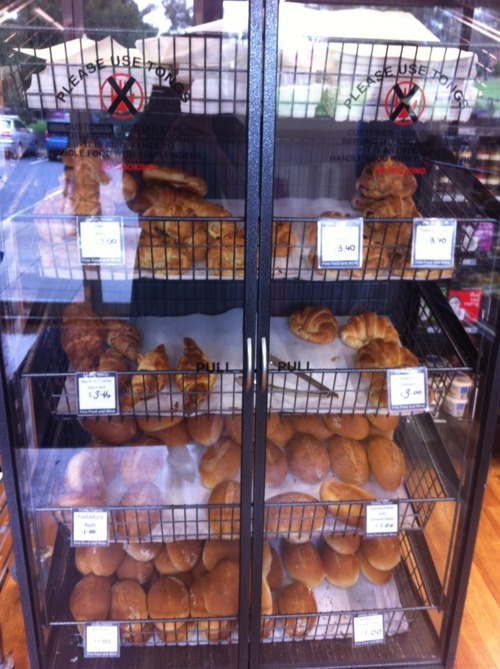 A cute small space with so many different options of bread, bagels and baked goods. Also a variety of hot food. 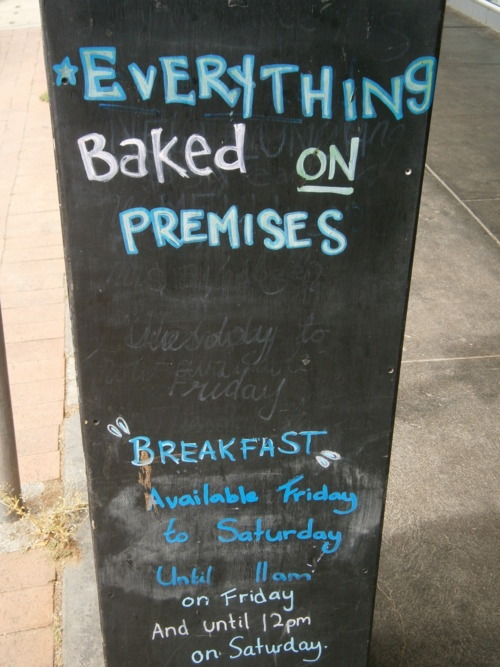 ‘Everything is made on premises’ I was assured after asking where their sausage rolls were from. 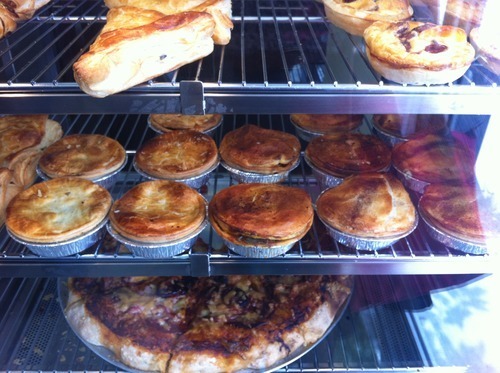 Despite a long list of pie and sausage roll flavours, including butter chicken, chicken mornay, beef and chilli and pork and fennel, they only had “plain” of each that morning. I asked the assistant which was better, the sausage roll or the pie and she told me that she was a vegetarian for 6 years and the sausage rolls changed that. It was really nice meaty sausage roll ($4.00) and you could tell it was home made with hidden vegetables inside the mixture. I didn’t even need sauce! Cinnamon and sultana bagel and cheese bagel- the bagel had a nice crunch to the outside whilst still be soft and fluffy in the middle. I haven’t had many encounters with bagels but my friend said that she could make better. 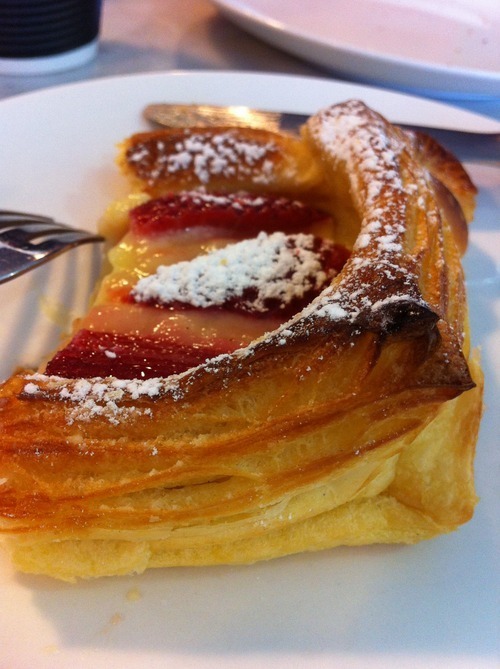 It was around 9am when we ordered the strawberry and rhubarb danish ($3.90) and when I took my first bite, the custard was still slightly warm, the pastry was soooooo good being really crunchy and flaky. One of the best pastries I’ve had in a while- amazing! 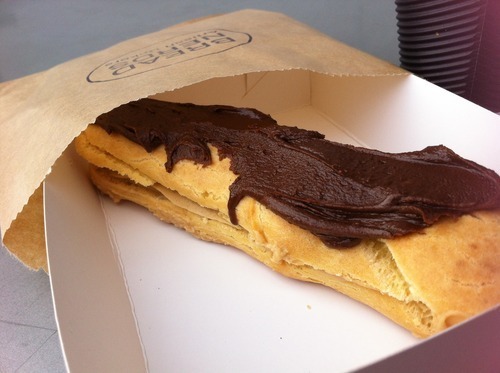 Coffee eclair– a strong coffee cream flavour, despite the messy imperfect glaze, the choux pastry was very fresh and tasty. Past the food van in a big red building, Unit #4. I hope you find it! 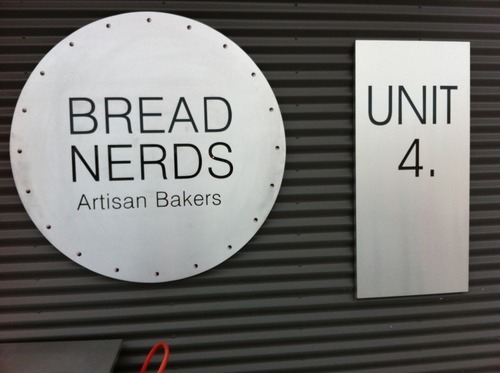 Despite the odd location and hours, I look forward to many more visits out to Bread nerds to try all their interesting pie flavours and delicious baked goods. Don’t underestimate the power of advertisement. I had been hearing that Blu Ginger was doing $10 lunch specials in the radio to celebrate their 12th Anniversary. One day (even though I had a packed lunch) something snapped and I suddenly had an irrational need for naan, so I grabbed a friend and off we went. There were a variety of $10.00 specials, some banquets and a little bit more expensive express lunches. 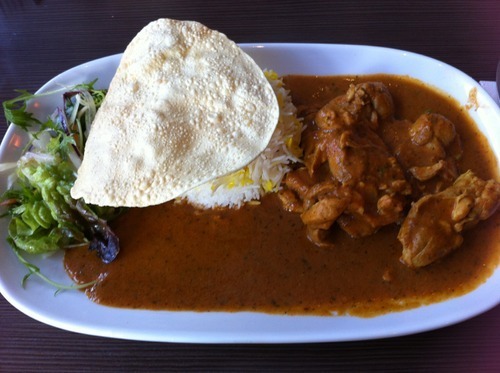 We both chose the same, a ‘Just for me curry express‘ with desi chicken as the chicken curry of the day (I was under the impression you could choose the chicken curry otherwise I would have had butter chicken) served with a fresh salad, rice, papadums, garlic naan and complimentary sweet corn pumpkin soup ($10.00). 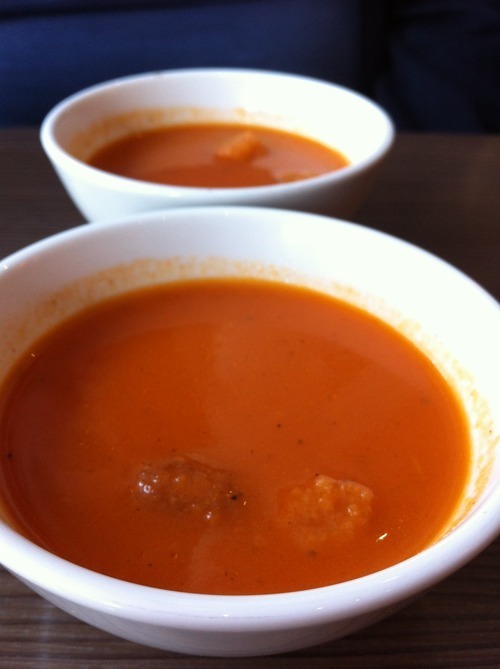 Turns out the complimentary soup was really tomato soup, it was still very tasty served nice and hot with really crispy croutons. 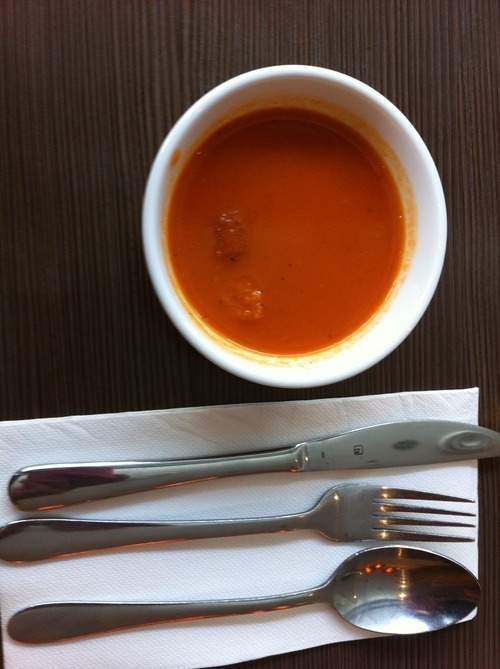 Don’t be fooled by the photo, the bowl was only this big (using cutlery for scale). 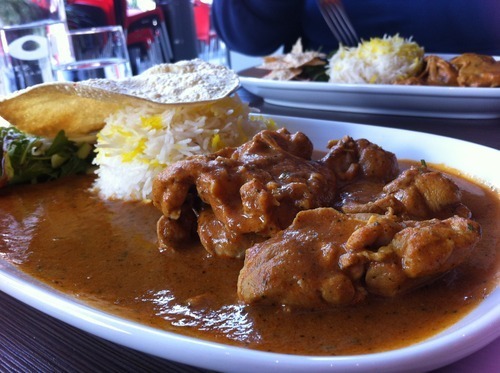 The desi chicken is a home style chicken curry made with chef’s own recipe. It was a lovely curry with a nice spicy chilli kick to it, I could eat it with lots of rice and naan and my chilli tolerance is pretty low. 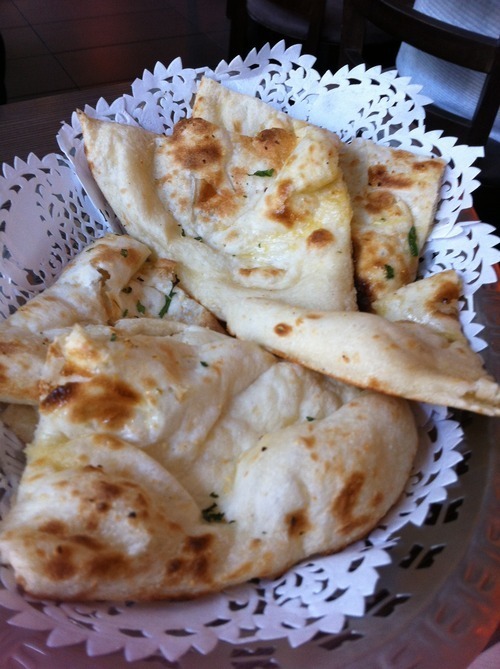 Four pieces of nice hot garlic naan each. With the promise of being served within 10minutes of seating, we were in and out just under an hour which is pretty good considering that includes my slow eating habits. Every time I go, the staff have always been really friendly. Hurry this $10.00 lunch special is only on for the month of July. I have some work friends who are also keen foodies and we wanted to go out for lunch. We decided against Asian as we had it the last few times and we wanted to try something different, but when you take out Asian it really cuts down on your options. 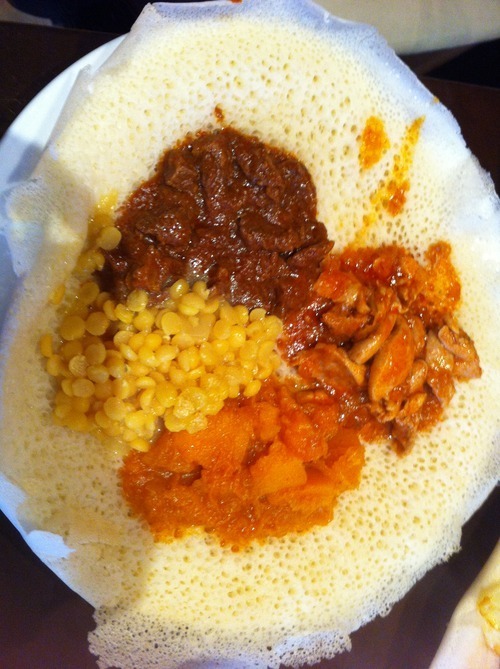 Ethiopian- we’ve all eaten it and probably have eaten at the same two restaurants: Fekerte’s and Ethiopian Down under. 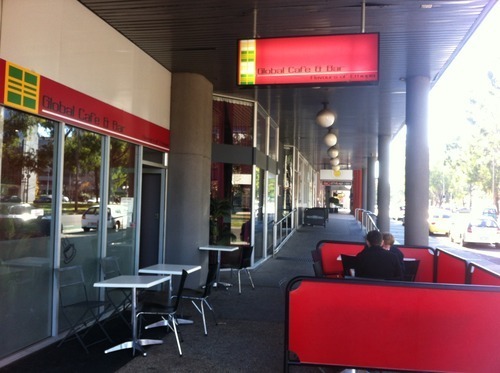 So when I mentioned that I had seen a new (well new to me) Ethiopian restaurant near the Jolimont centre, we quickly google street mapped to stalked down Global cafe and bar. 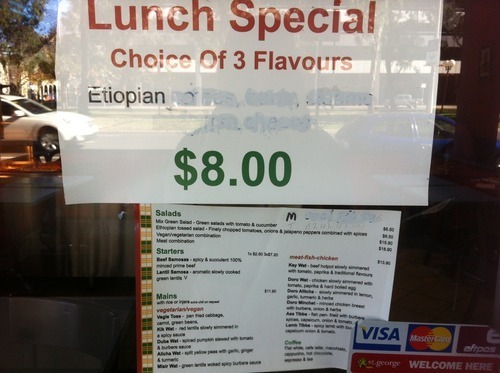 We didn’t realise they had a lunch special, it was just a happy coincidence! 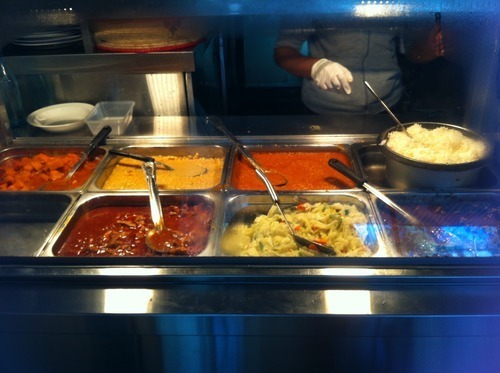 A selection of meat curries, lentils and vegetables. 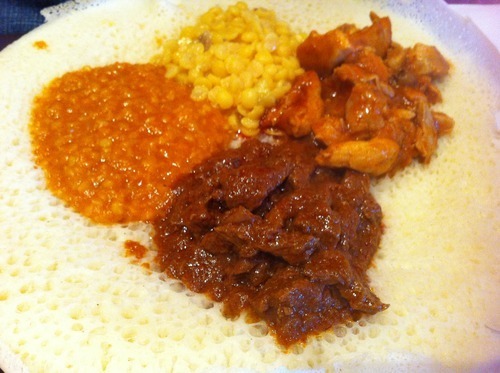 You get a choice of rice or Injera an Ethiopian bread. We decided to get rice for the table and everyone gets their own bread. 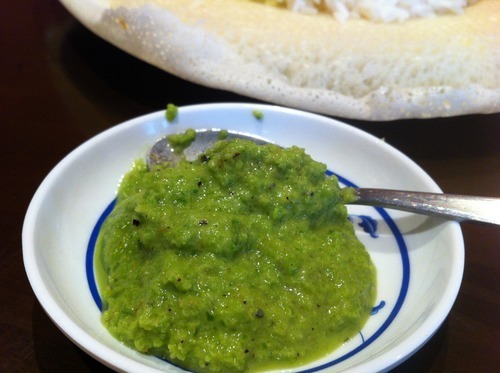 Alicha Wat– split yellow peas with garlic, ginger and tumeric. Vegie toss– pan fried cabbage, carrot and green beans. 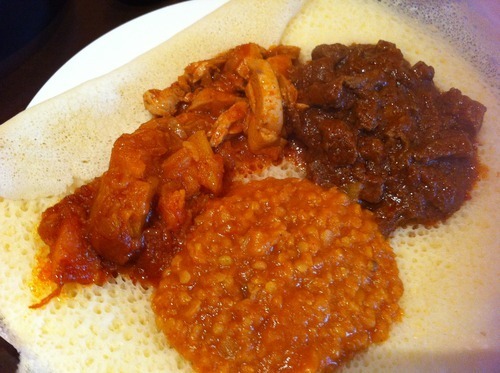 Duba Wat– spiced pumpkin stewed with tomato and burbere sauce. Kik Wat– red lentils slowly simmered in a spicy sauce. 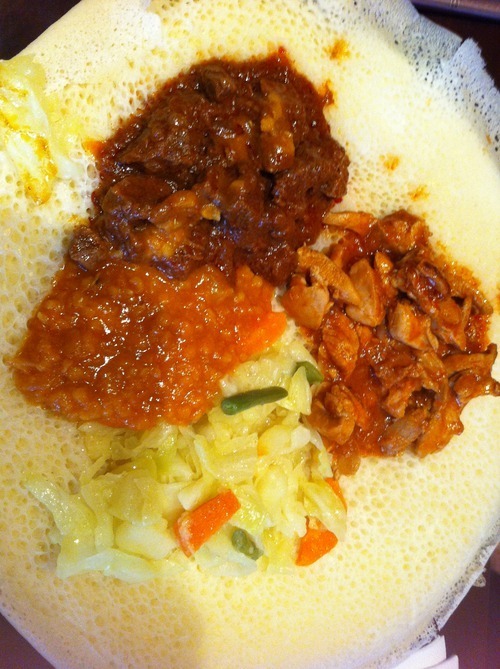 Doro Wat– chicken slowly simmered with tomato, paprika and hard boiled egg. Key Wat– beef hotpot slowly simmered with tomato, paprika and traditional flavours. Like every other meal, I found it very hard to choose which 3 curries I wanted so the lady who was serving us kindly let us try four. Pumpkin, yellow lentils, beef and chicken curry. Red lentils, vegie toss, chicken and beef curry. Chicken, beef, pumpkin and red lentils. Red and yellow lentils with a chicken and beef curry. A chilli paste that I was not daring enough to try. 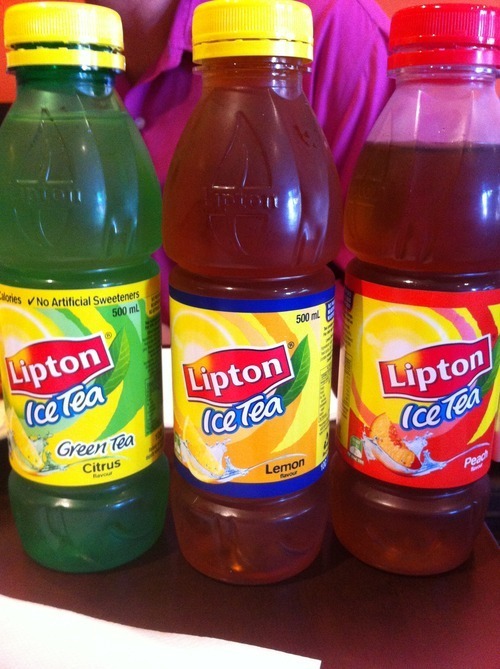 Some Iced tea to wash it all down. Service was very casual and friendly and with everything already cooked you can have a cheap fast lunch here with little effort. 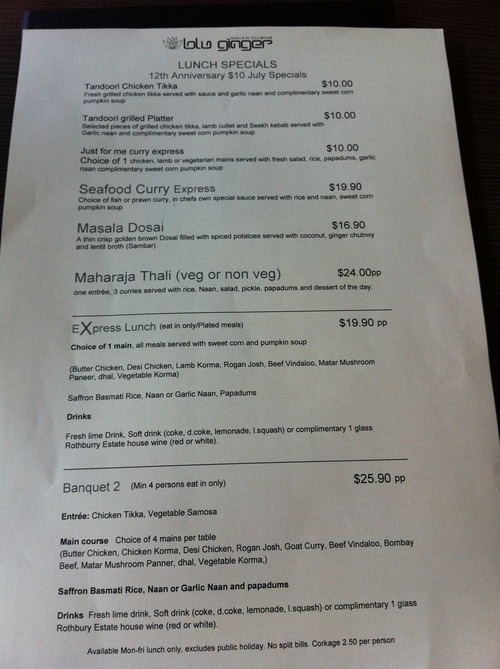 The curries were somewhat flavoursome and it was great to see such a variety in flavours but not working in the city and having to find a car park, I don’t think it was that fantastic that I would come out of my way to eat here again, even if it is $8.00 for the lunch special. 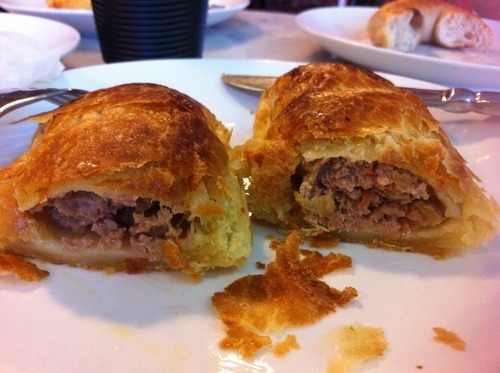 I love discussing food and after talking to some work colleagues about pastries, one of them mentioned delicious croissants and pastries at Chifley shops. I had no choice but to head out first thing Saturday morning to Chifley! 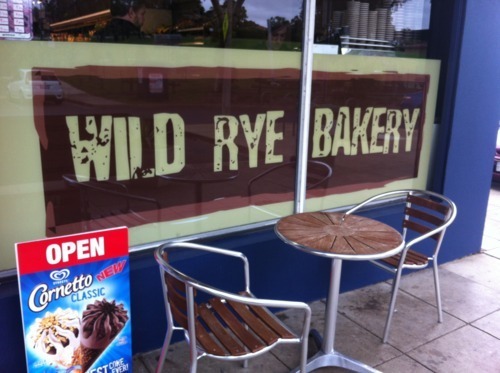 Wild Rye bakery is located within the supermarket at Chifley shops. 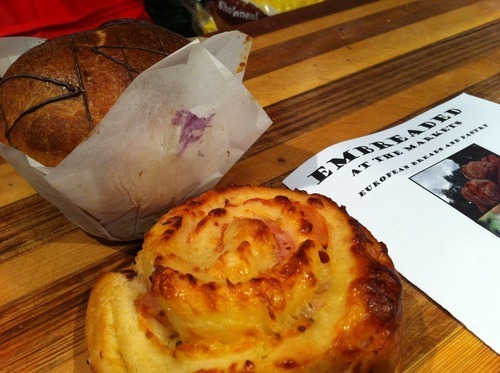 Croissants, breads and tarts – oh my! What to choose? poppy seed croissant – oh my! When my work friend told this was her favourite, I thought it was an interesting concept: ‘poppy seeds were inside a croissant’. This was possibly my favourite bakery treat, the poppy seeds make a sweet nutty paste inside an almost hollow croissant. 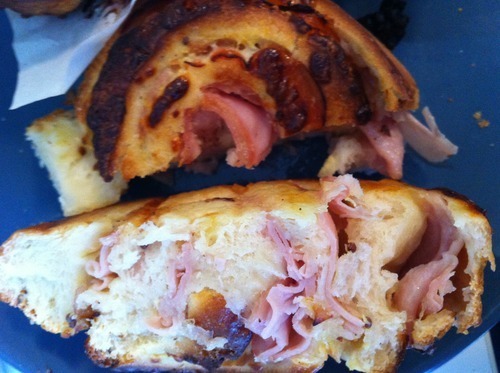 cheese and bacon croissant – I am a big fan of bacon and cheese anything, so I was surprised to find that this wasn’t my favourite bakery treat of the day. I much prefer bacon and cheese rolls. cream cheese and sultana danish – a nice ‘not to sweet’ combination. apple danish – this would have been more delicious if I warmed it with some ice cream! If you’re thinking about running to Chifley shops now to grab some croissants hold your horses, I hear the best day to go is Saturday, preferably in the morning to avoid disappointment. You would think I would be content with all these bakery treats but I convinced Timmy to come with me on another bakery adventure as I heard there was something worth travelling to Curtain shops for. 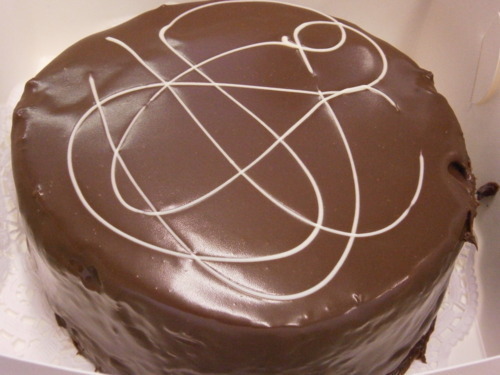 My mission: go to 210 degrees patisserie & bakery and pick up my mud cake that I purchased through ‘GrabOne’. It’s not like I didn’t achieve my goal, I just happened to leave with a lot more than one cake. 7” mud moist mud cake, a bargain for $9.00 though the ‘GrabOne’ voucher. 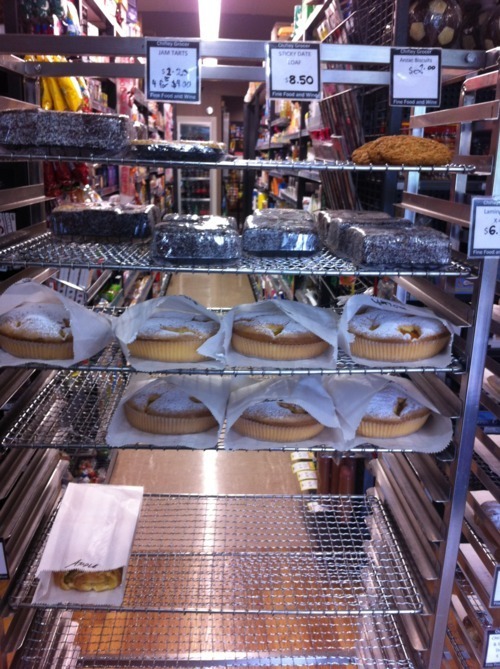 There is so much to choose from- bread, foccacias, pastries, slices, tarts, savoury tarts, cupcakes, slices, cakes and daily made rolls. 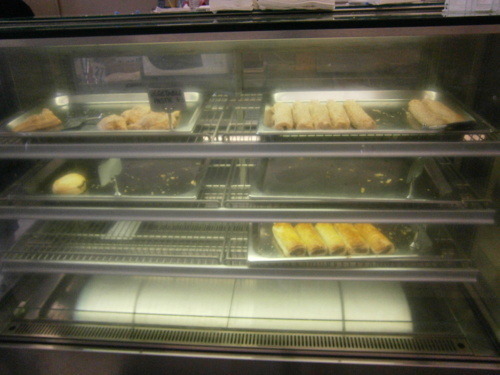 I was looking at the semi-empty pie cabinet and since it was well before lunch time, they looked to be very popular! I asked how long it was til the next batch of pies, they said it was going to be 20 minutes, “I’ll wait!”. While I was waiting, there was always a steady stream of people coming in, the staff were friendly and the coffee smelt amazing. The smell of delicious pies wafts through the store as they were being cooked. Mmmmmmmmm finally, the shelves are re-stocked! While I was deciding what pie I wanted, someone inquired what the thinner sausage roll was, ‘an italian sausage roll with wholegrain mustard’. SOLD! 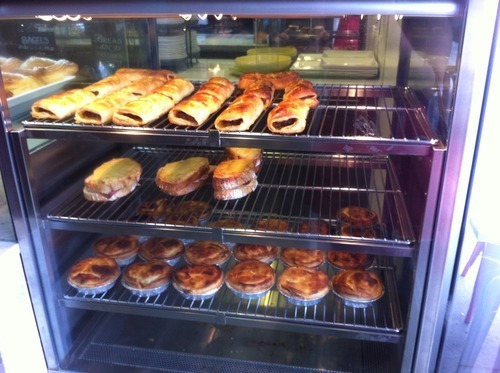 I want a cheese and bacon pie and one of those! 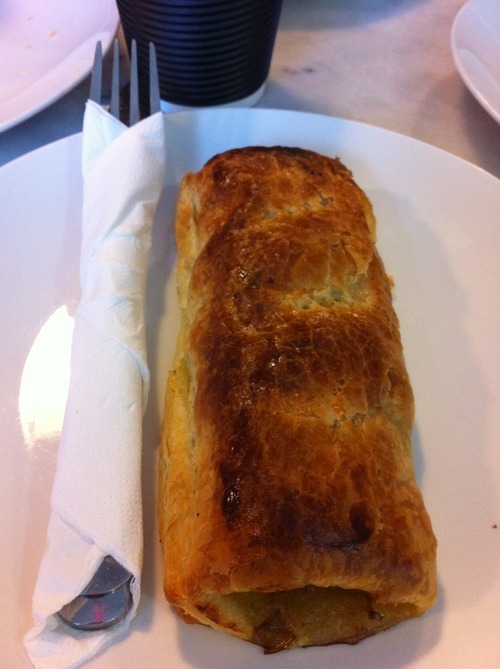 The sausage roll was piping hot and delicious! 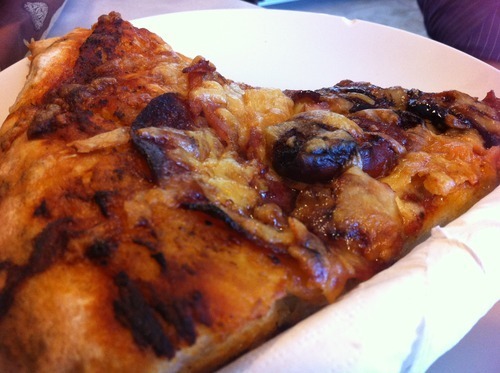 The cheese and bacon pie was one of the best I’ve ever had, the perfect balance of all the ingredients. 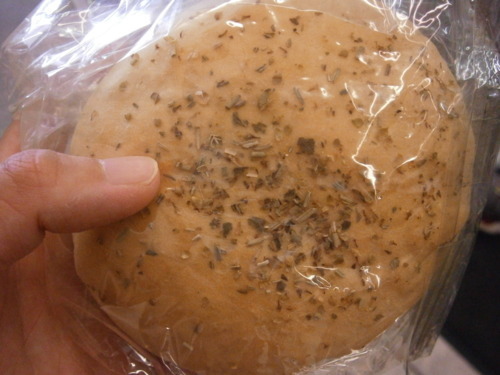 A fresh roll- delicious with a nice oregano flavour. 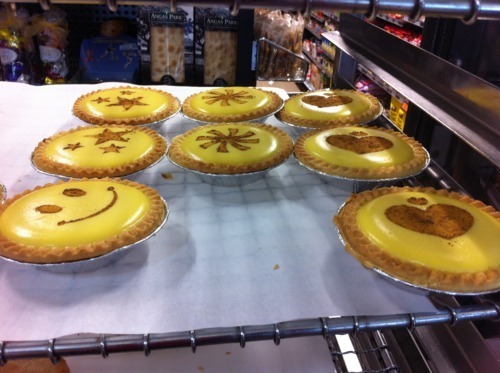 The tarts looked so beautiful, I couldn’t not leave without one… Or two? 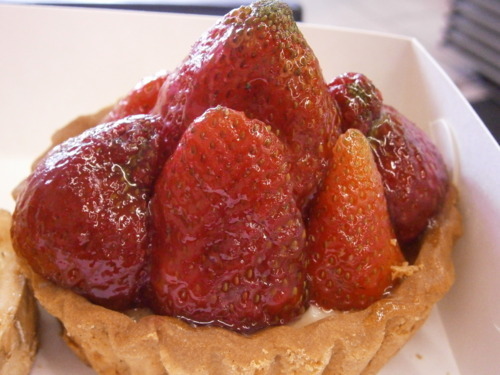 Strawberry tart– I had to get one because the last time I got one I only got one nibble This was SOOOOO yummy! A bit hard to eat because of all the strawberries but if you’re not sharing, it’s not a problem. Crème brulee tart– it had a slight toffee crunch that I could crack with a spoon that made me squeal with excitement! The tart was Ah-mazing! 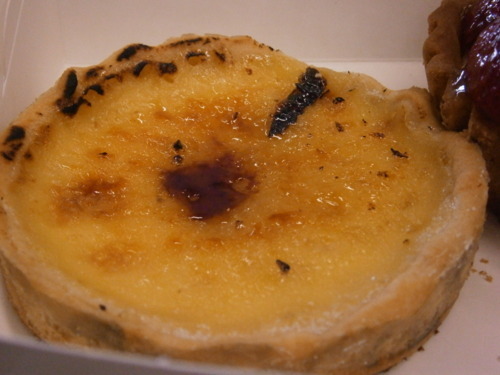 It was truly a crème brulee in a tart! 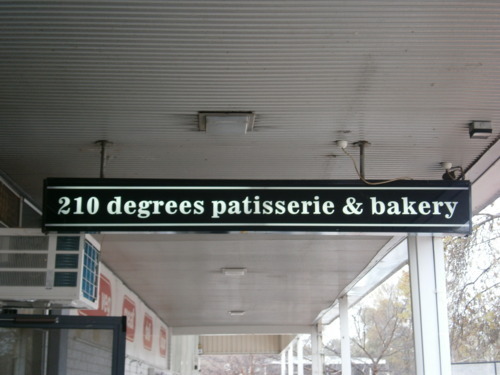 I asked them why ‘210 degrees’? and they said that it is a good temperature to bake bread at, which I thought was very cute. Everything I’ve tried was really good and I’m excited to go back and try more (and grab a few more tarts!). Go earlier to avoid disappoint of empty shelves!